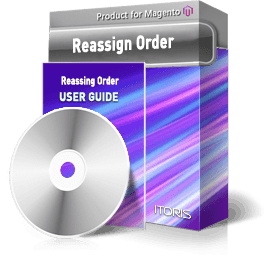 Reassign orders manually or associate guest orders with existing customer accounts automatically by email using the Reassign Order extension for Magento. Collect order reassignment details in one place, re-assign multiple orders to customers in bulk, view reassignment history and enable email notifications. Assign guest orders to existing customer accounts. Let’s say a user placed a few guest orders and then decided to create an account. Help the user combine all the orders into a single account using the Reassign Order extension. Guest orders will be assigned to the account on checkout automatically if the order email address matches the existing customer account. The Reassign Order extension also allows you to assign any guest orders manually in the Backend. Just open the guest order, choose the customer from the list to assign the order to and click “Assign”. The extension will inform the customer about the completed reassignment by email. You can also overwrite the customer name and email if necessary. Your customers can make purchases using different emails. Now you can easily associate a number of guest orders with the existing account using the mass actions. Choose multiple orders, select the necessary mass action and the customer. All the chosen orders will be reassigned to the selected customer. Track all order reassignments on the order view. You can view all records once the reassignment has been completed. The extension shows the date when the order was reassigned, the customer name and email. You can also replace the guest name with the existing customer name. Send the notifications to the customers once the order is assigned to the account. You can easily customize the email template by adding more information, catchy images or links.